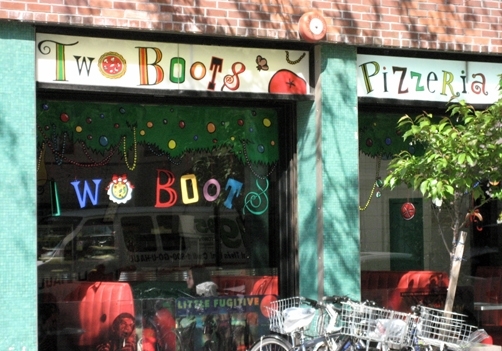 Every city has a fringe, but Portland maintains an unusually visible odd streak. From a fiercely independent music scene to clowns riding tall bikes and marching bands on stilts, Portland prides itself on its quirky nature. Here are a few of the annual festivals that give the Rose City its unique atmosphere. Every September, in the shadow of the St. Johns Bridge, scurvy buccaneers invade Portland’s beautiful Cathedral Park. 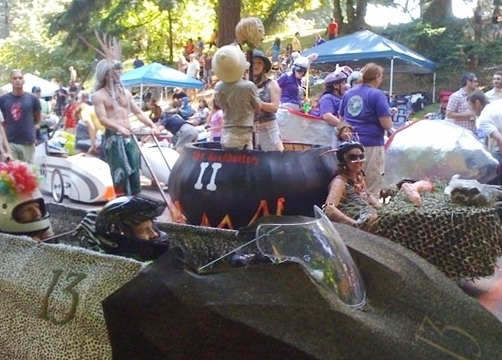 Part interactive theater experiment, part country fair, part costume party, the Portland Pirate Festival is reportedly one of the largest pirate gatherings in the world. Wander across the grass and you’ll be accosted by one-eyed men who ask if you’ve seen their treasure hereabouts, and buxom wenches serving up beer from local Rogue Brewery. Children will get lost in the wonders of Scupper Monkey Island, a playground of bounce castles, face-painting, and puppet shows. “Pirate entertainment” casts a wide geographical net, but manifests mostly as indigenous music from around the globe. Focused on the Caribbean and Polynesian music and dance, the festival also features Scottish Highland, Spanish gypsy, and belly dancing performances. But for serious swashbucklers, the cannon demonstrations and sword fighting re-enactments make the weekend. These demonstrations help ground the giddy festivities in historical reality. Many pirates here take their roles seriously, building a character over several days or even years. But even the most casual marauders wear costumes all weekend. Once a year, Portland’s residents trade in their iPhones for mugs o’ grog and a rousing round of sea shanties. While the city has gained a reputation as bike-friendly, nothing could prepare a visitor for Portland’s two-week paean to the bicycle: Pedalpalooza, a series of 200-plus loosely connected events, all on bikes. Serious racing cyclists will not find much competitive spirit here; Pedalpalooza caters to a casually bike-crazy population that loves to cycle around town in search of fun. Bikers of every persuasion can participate in these free events. Beginners can take a casual ride through a quiet neighborhood. For the adventurous, bike polo and bike jousting take over the city parks. Garden tours, brewery tours, and scavenger hunts roam the city. At night, mobile dance parties bring the funk by strapping on a boom box. Pedalpalooza kicks off with the World Naked Bike Ride, a 10k ridden in only birthday suits. Riders must be 18 to participate, but other than that, few rules apply – par for the course in the community-oriented, almost anarchic atmosphere of Pedalpalooza. Big kids relive their childhood street-racer dreams each summer in the PDX Adult Soapbox Derby. Mt. Tabor, Portland’s urban volcano, hosts the races. For a day, cars made of recycled windshields and welded metal stream down the hill. Usually a shady park filled with picnics, joggers, and kissing couples, Mt. Tabor becomes a racetrack for a day. From the sleek to the silly, 39 cars run preliminary heats to advance; three cars ultimately race for the title. Spectators from the neighborhood and all over Portland come out to watch the races, cheer on their favorite cars, and maybe even witness a crash. Rules are few, but include functional breaks, power by gravity alone, and a horn. Participants should in good faith spend $300 or less on the car, to keep the races to a level where many community members can participate. But the designs are often ingenious, and the Derby organizers encourage invention and creativity. The Alaskan Iditarod is one of the most grueling tests of human endurance on the planet – one person and her team of loyal dogs sledding across the vast expanse of frozen tundra. Portland’s version involves a costumed “musher,” enthroned in a shopping cart, being pulled through downtown by four friends. Over a four-mile course, this race is more fun and only slightly less grueling than the original. Luckily, it also includes multiple rest stops for beer (“watering the dogs”). Creative costumes abound. Sleds range from Viking ships pulled by Valkyries to nuns pulling Jesus. In 2009, a team of loincloth-clad cavemen pulled a cart of mankind’s first fire, which was actually on fire. Applaud the Alaskan endurance sledders if you like, but running through Portland in a loincloth in March takes true grit. The Urban Iditarod hardly qualifies as a race, since there are no official winners declared. For safety, actual canines are not invited to participate. On a calm morning, as you’re headed to work, sipping your latte, you may notice a zombie staggering down the sidewalk toward you. Or several thousand zombies. Released into the streets, a parade of Frankenstein’s lurches through downtown for a few hours. While many of Portland’s alternative festivals encourage frequenting the local watering holes, the Zombiewalk is more of an interactive theater performance. Held in late October, the Zombiewalk offers a chance to debut creative Halloween costumes, such as Zombie Sarah Palin and Zombie grandma. And zombies care. The walk raises money for the Oregon Food Bank. Nothing says “Keep Portland Weird” like a few hundred zombies giving food baskets to the poor out of the goodness of their undead hearts. www.keepportlandweird.com, or check out our list of the Weirdest Cities in America and find out where Portland ranks or take our Weirdest City in America Poll. Caitlin Dwyer is a freelance writer from Portland, Oregon. Poet, screenwriter, journalist, and teacher, she loves placing words in skillful combinations. Born with a travel itch, she has recently traveled in Italy, Greece, Turkey, and Thailand, and plans to circumnavigate the globe in 2010. Her travel blog can be found at caitlind.blogspot.com.